A child's painting is burned when a visitor uses a (real) lighter on it. This interactive installation is a comment about the human greediness towards nature. It was specially designed for an exhibition about the ancient myth of Erysichthon. Based on an idea of Harris Kondosphyris. 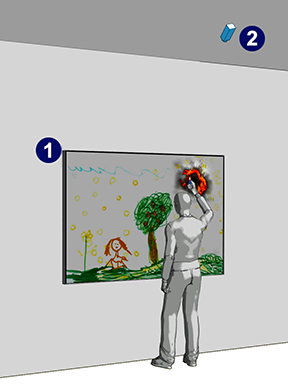 The installation components are shown in the image on the right: a computer (not shown) renders the animation in real time and presents it in a large monitor (1). The visitor is using a real lighter that is tracked by an infrared camera (2).